The wine list combines an extensive selection of national and international wines with wines of local origin from our Rostei family vineyard in Begur. Rostei Crianza: A combination of Cabernet Sauvignon and Merlot, aged twelve months in French oak barrels. 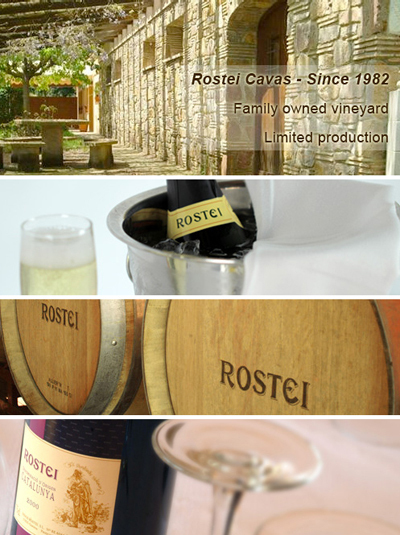 Rostei White: A variety of Sauvignon blanc, aged in French oak barrels with intense floral bouquet and fruity flavor. Rostei Rose: 60% Cabernet Sauvignon and 40% Merlot, a fruity, clean and fresh wine with a smooth and persistent aftertaste. Reserva: 60% cabernet sauvignon and 40% Merlot, aged in Allier oak barrels for two years. Intense flavors, with a smooth aftertaste. Champagne Rostei: 100% traditionally made.